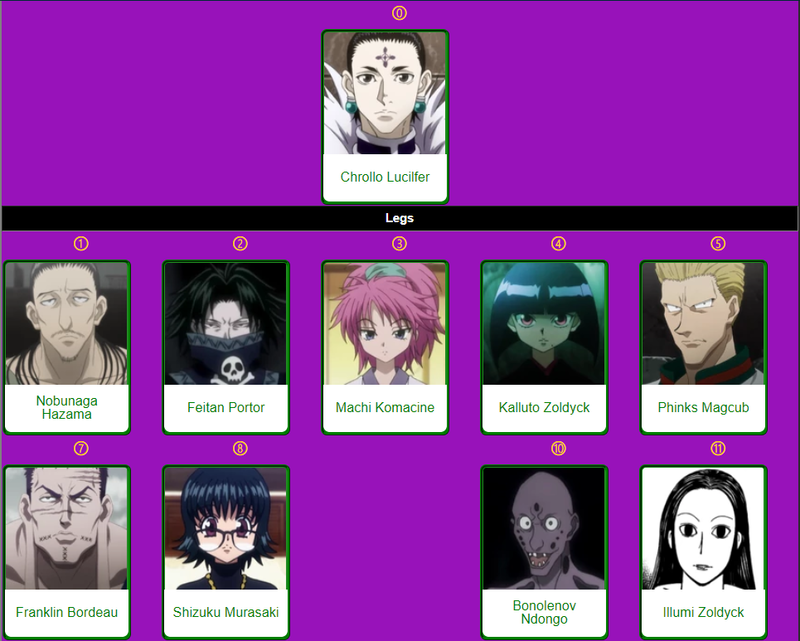 Did someone replace Uvogin in the Phantom Troupe? did someone replace him? It is said that Kalluto replaced Hisoka. I wonder why him, specifically, seeing how Uvo left earlier than him. Or should it be assumed that Kalluto just took Hisoka's number? Did someone replace Uvogin in the Phantom Troupe? Yes, Illumi Zoldyck replaced him as No. 11. It is in Volume 36 Chapter 377. The image below is taken from the wiki. 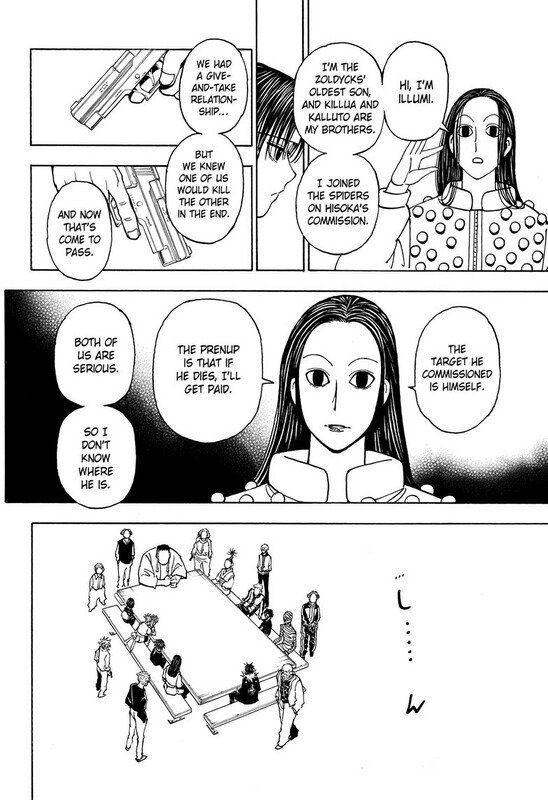 As to why Illumi joined the Phantom Troupe, it is simply because Hisoka asked him to. He elaborated that Hisoka commissioned himself as a target to Illumi, and he joins just like that, and no questions were raised by the other Phantom Troupe members. So, if Illumi kills him, he gets a reward. Exactly what reward, it is not yet known. As to why Hisoka would want someone he is quite close to to kill him, I cannot say. He is quite unpredictable throughout the story. 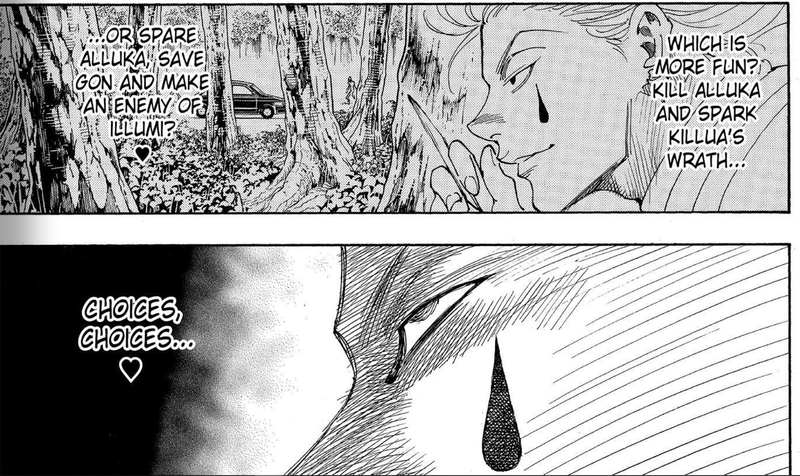 However, when him and Illumi were hunting Killua and Alluka during the 13th Hunter Chairman Election arc, it is shown that he delights in the feeling of someone who have a desire to kill him. He is even debating on whether to gain Killua's or Illumi's hatred. (Chapter 330) This could be one of the reasons he asked Illumi to join the Phantom Troupe to kill him. Should it be assumed, that Kalluto just took Hisoka's number? No assumptions need to be made as this was also made clear in the manga in Chapter 377. So, yes, Kalluto is the new No. 4. Not the answer you're looking for? Browse other questions tagged hunter-x-hunter or ask your own question. In which chapter did the Genei Ryodan fight the chimera ants? Is “Phantom Rouge” story canon? What did Hisoka do in the Hunter Exam? How did Hisoka make the examinee's arms disappear? Why did Killua kill the opponent of Leorio? Why did the Phantom Troupe let Gon and Killua go? Why didn't Kurapika manipulate Uvo to tell him all the information about the Phantom Troupe? What card game is being played by The Phantom Troupe? What is the song in Hunter x Hunter when someone is about to power up? Who tattoos the Phantom Troupe?